"Record audio in two formats at once." Contrary to popular belief, the format in which a file is saved matters. If you produce audio for general distribution (posting to social media, uploading to music sites like Soundcloud, or selling through iTunes, Amazon, or Google Play Music) you should definitely pay attention to the following information regarding the Dual Audio Recorder from Adrosoft if you are not already familiar. In a perfect world, audio formats wouldn’t matter. Each one would sound the exact same, be useful in every situation, and be compatible with any program and device. In fact, since they wouldn’t matter, we’d probably have only one universal format that everyone used. If you’re not familiar with or work in the audio-entertainment industry, you probably thought that we already had a universal format. You probably think that it is the .mp3 format. Sadly this is not the world that we live in. 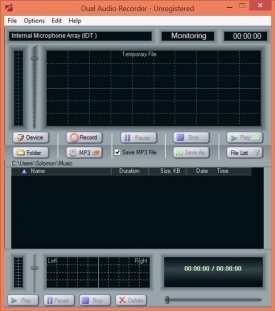 The audio format MP3, short for MPEG - Motion Pictures Audio Group - and 3 - audio layer 3, is a patented audio format. This means that several companies have government-granted monopolies over parts of the MP3 standard. Companies, by law, can decide whether or not to permit the use of that particular MP3 even if the MP3 was created using software that was not created by any of those companies. Beyond patent trolling, there are several other factors that would/or should affect your decision on which audio format to use. For example, it is recommended that you utilize an audio format that utilizes a lossless data compression algorithm. LDC algorithms exploit statistical redundancy - the number of bits used to transmit a message minus the number of bits of actual information in the message - to represent data more accurately without losing its information. 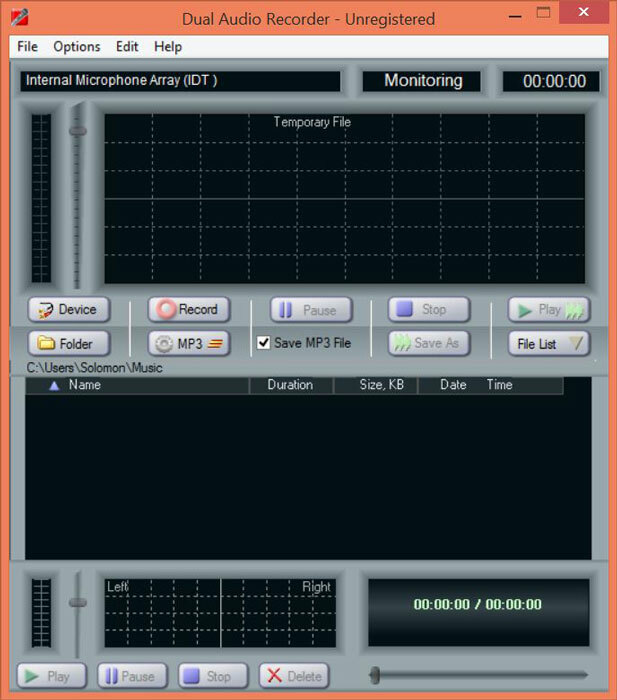 What the Dual Audio Recorder from Adrosoft allows you to do is record audio to two different audio formats so that you can choose, later, which format you would like to use. Pretty simple right? But that’s not it. You can also edit the files after the recording right from the application. 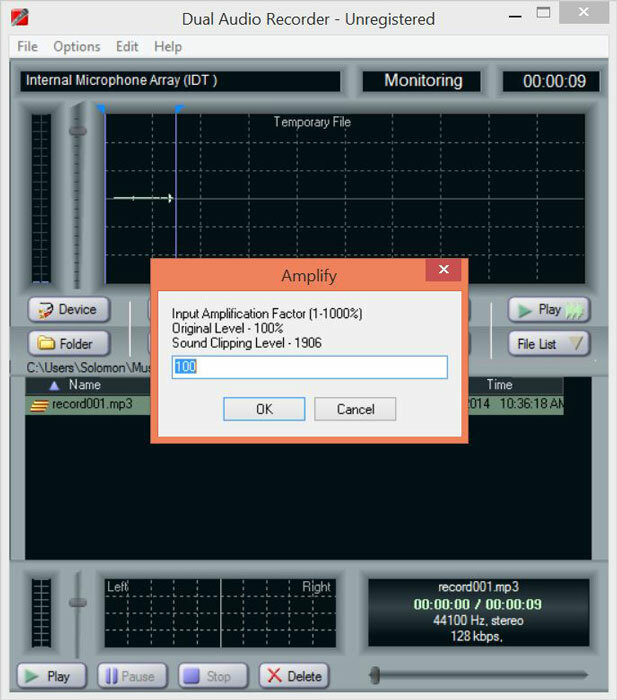 The edits that are permitted within the application are: amplifying, normalizing, and fading in/out. 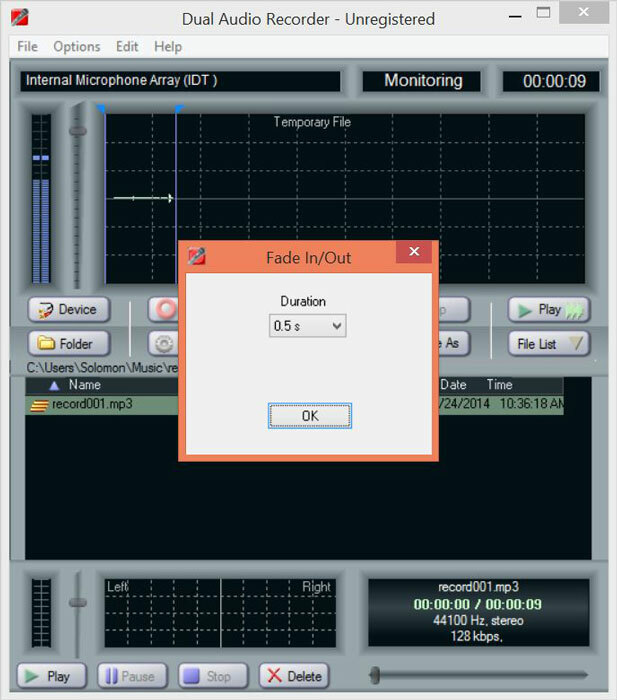 Before you record DAR allows you to select a recording device; if you have a custom/ third party microphone that you would like to use during the recording, you can do so easily with DAR. The built in player displays peak level and spectrum of a played sound and shows the main audio file properties so that you may make adjustments as necessary. Supported formats include: MP3, OGG, WMA, WAV, and FLAC. The application’s interface is fairly simple and extremely easy to navigate through. Most of everything you will ever need to be successful when using this application is accessible from the main interface. The average user will almost never need to venture out into the top menu. The various windows in the application are easily distinguishable due to the thick dividers that separate them from one another. You also have access to a convenient file browser located at the center of the application that allows you to browse your previous recordings.